Make yourself at home: that’s the message to the public in Melbourne’s Federation Square, with deckchairs provided so you can chase the sun, or cushions to make sitting on the stairs more comfortable. Is there a lesson here for Alice? Most of the services located underground in Todd Mall have now been identified and August is the expected start date for the first stage of redevelopment works. These will focus on Parsons Street – widening the southern footpath, resurfacing the footpaths and road, redoing the stormwater drainage which will feed a water feature, introducing trees. Pedestrian areas will not be affected in the lead-up to Christmas, with the works stopping short of the bandstand. The sails and bandstand will be removed starting mid-January 2013, and roadworks will continue, creating the bend that will ultimately connect with the road into the northern end of the mall from Wills Terrace. At this stage public art and shade structures, the design of which has not yet been completed, will also begin to be installed. Roadworks at the north end are planned to start in mid-February 2013. The underground services have been detected using ground penetrating radar survey equipment, allowing tender documents to now be drawn up. But “we could get surprises when we start digging”, says the Town Council’s director of Technical Services, Greg Buxton. Council is the project manager. Mr Buxton says there are no “as build” drawings for the mall older than about 10 years, to show where everything is. The tender will be advertised this year in June, a contractor appointed in July, with the August commencement date allowing “a bit of wriggle room”, says Mr Buxton. The public and mall traders will be advised of the timeframe for works in July. Meanwhile, Alice Springs will pass through another tourist season and head into another summer. Is there something to do other than wait? New councillors were keen to take part in the Todd Mall Redevelopment Project Team: four of them are on it – Crs Geoff Booth, Steve Brown, Dave Douglas, Jade Kudrenko – together with Mayor Damien Ryan and Deputy Mayor Brendan Heenan. It has met once to date, to receive a brief on the location of underground services, says Cr Heenan, and is due to meet again in the next couple of weeks. They could put their heads together on initiatives other than capital works. People and activity are what will make a true difference in the mall, the town’s premier community space as the fortnightly markets and sporadic festivals and parades make clear. Council could move, at little cost, to extend this kind of atmosphere on a small scale: what about calling for expressions of interest in running a coffee cart or pancake stall in the evenings (ice cream in the summer months)? 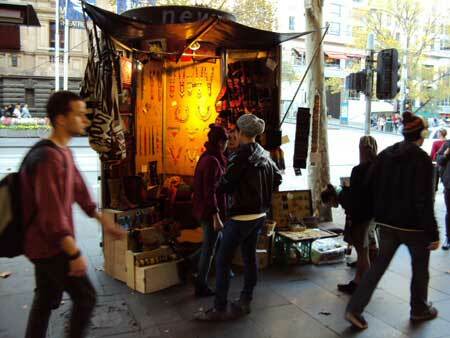 Arts and craft stalls, perhaps on rotation, year round? 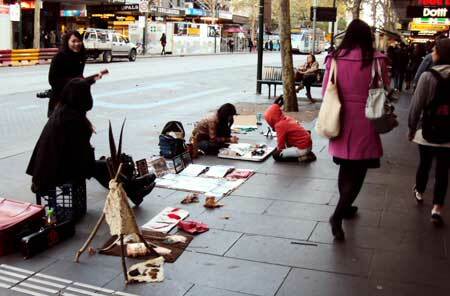 Should the permit system be revisited to encourage art sellers and buskers, rather than restrict them? Melbourne City gets this right, and more. 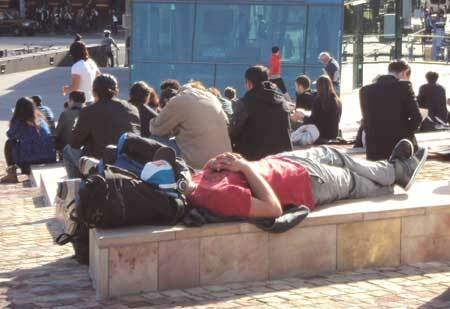 They get it that people simply strolling or sitting in the sun – or for that matter sleeping – is all part of the life you want to see in in your public spaces. 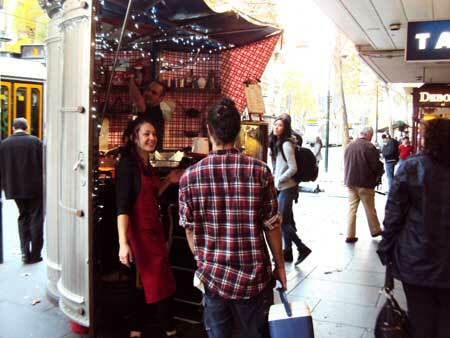 Pictured above left: A former newstand converted into a coffee stall, adding to the liveliness and appeal of Swanston Street in Melbourne. Could Alice Springs Town Council call for expressions of interest in running something like this after hours in the mall, when the cafes close? Pancakes in winter, icecream in summer? 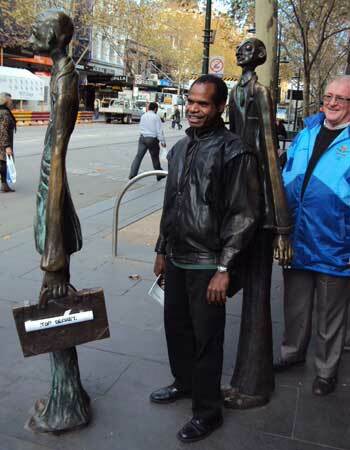 Above right: Having fun with public art. Apart from having the guys having their photo taken, someone has also made a harmless addition to the briefcase – the rolled piece of paper, attached with sticky tape, reads ‘Top Secret’. Below, first three: An ordinary shopping street becomes something much more – economic opportunity for some, simple enjoyment for others, Swanston Street, Melbourne. 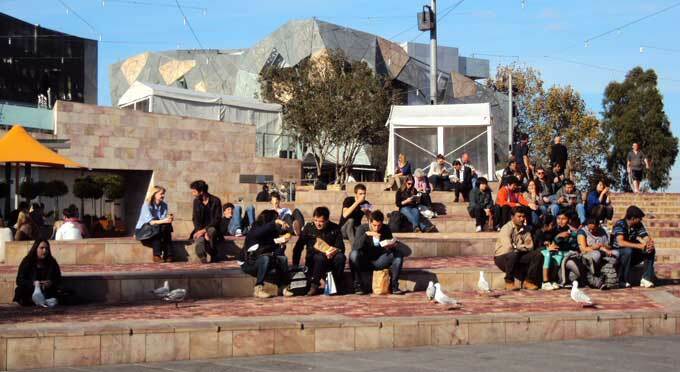 Below, bottom two: People relaxing at Federation Square, on their own, in couples, in groups, chatting, reading, eating, waiting, dozing, catching the sun. @ Hal Duell Posted May 26, 2012 at 6:53 am. 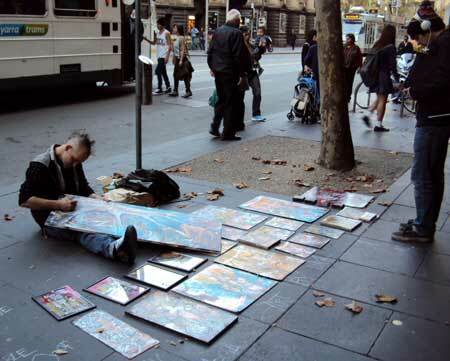 The simple things being done on the streets in central Melbourne do not depend on vast numbers of visitors, whether resident or tourist. What’s relevant is that they reflect an attitude to public space and there’s no great cost involved, which is why I took note of them. Apart from the deck chairs and cushions they are all things that are already done in Alice from time to time – coffee carts, buskers, arts and crafts sales. My point is that council could think about these activities more strategically, to enliven our public spaces, especially the mall, on an everyday basis, especially in the evening hours. While it’s important to wish those who are doing this work well, especially as it’s our Todd Mall they’re reconfiguring, the outcome as envisaged remains uncertain. Comparisons with Melbourne’s Federation Square and Swanston Street have to be a bit of a dream as that area attracts upwards of 6 million visitors a year. And that’s before counting the population of the surrounding CBD. The vibrancy of Mitchell St in Darwin might be a more realistic reach, although even that is hard to see coming since we are set to lose one half of our mall area to traffic. Nothing quite puts the spike in a casual stroll down a pedestrian mall like dodging traffic while breathing its exhaust. And a water course? In a town where the flower beds are bitumenised to keep them from being used as public toilets? Still anything is possible, and if we are to have a CBD where we can all meet without fear by day and at least until midnight, we have to make a start. I would love to see the Mall full of shops, restaurants, coffee shops, cafes lining Todd Mall. It used to be alive and vibrant 10 years ago. We need that business and consumer confidence back again. We could do without idiots spilling out of the pubs. It would be good to get the mall like Darwin’s Mitchell Street, with its vibrancy. That would be sensational! It is exciting to think of the possibilities for Alice if we can get it right. The after hours coffee stall would I think go really well. Every afternoon closing up the cafe I work at, I see frustrated and bewildered visitors and annoyed locals unable to get a coffee much after 3.30! Thanks Kieran for the inspirational window into another city doing it well!